Cryptomeria Japonica trees are fast growers at about 3 feet per year. It is known to thrive in a range of soil types. Cryptomeria grow with a pyramidal/semiformal shape. 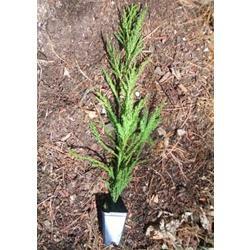 Recommended Zone	5, 6, 7, 8, 9 Scientific Name	Cryptomeria japonica Mature Height (ft)	35-40 feet. Mature Width (ft)	15 feet Growth Rate	Moderate Fertilizer	5 Feet for quick privacy. Light	Sun, Light, High Shade Size at shipping: Approximately 1 ft.